When you say put your existing cockpit on the new frame, which existing bike are you reffering to? A noodle combo I had on the Hunqapillar a year ago. Sitting on my shelf in pretty good matching color to the new bike! Will anxiously await some pics and ride reviews.. had my eye on the Toussaint for some time now. 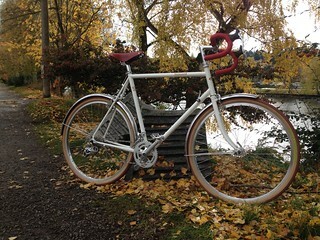 Just haven’t quite pulled the trigger yet..
What will you do with the Soma frameset? Free Range will either cancel order or build it up. Not sure what Kathleen is planning, but it sounds like they are several weeks out still.